I usually work from drawings done from life, only occasionally from a photograph and this is one of the rare original prints, a monotype, done entirely from a photo. I took the original image on a digital camera when I first visited Pakistan back in 2007, an amazing, life-changing journey. We travelled up the Khyber Pass, with an armed guard, and I saw this refugee family returning to Afghanistan. The security situation was much better then and I often wonder what happened to them, whether they were able to stay or whether they had to leave their home again. If you want to see how this monotype technique is done, click here…. I’m also running a short course in it at Swansea Print Workshop, please check on the right …..
Back in the 1930’s my beloved Aunty Nin saved hard from her wages at Swansea Market to buy a lovely Art Deco suite from the poshest furniture store in the area for the parlour of her tiny little council house. A generation later, my sister and I used to visit with Mam and Dad and if we were on our very best behaviour, we were allowed to sit in the parlour on the Art Deco suite. Aunty Nin, like many other older relatives, kept her tiny front room immaculately clean and tidy, with glass fronted cabinets filled with tiny ornaments and lacy antimacassars on the backs of the furniture. Meanwhile, they crammed table and chairs, television and even a settee into the kitchen, cooking, washing up, eating, socialising and watching TV all in the same tiny room, while the parlour was kept for best. Another generation later and my sister’s children were occasionally allowed to sit on the Art Deco suite in the parlour, but had to have their milk and Jammie Dodger biscuits in the kitchen. Eventually Aunty Nin became too old to live alone and I took the Art Deco suite, ripped and tatty with age. I found a wonderful furniture restoration firm and the suite was restored to its former Art Deco glory and now another generation of our family, Aunty Nin’s great, great nieces and nephews, sit on it. I don’t have a parlour and the little ‘uns are allowed to sit where they want, even with a handful of Jammie Dodgers. I have just submitted this drawing to The Guardian Witness #3000 Chairs. Last week The Guardian newspaper published Nicola Davies’s poem The Day The War Came about the 3,000 unaccompanied Syrian children refused a safe haven by the UK government. Davis called on everyone who felt strongly about this to paint/draw/sketch an empty chair and share it on Twitter with #3000chairs. Images have been pouring in from professionals, amateurs, children. It’s a moving body of work. In a few hours I’ll be starting my journey from little Wales to great big Pakistan. It’s a return journey for me; I visited in 2007 and I loved it so much that I’ve always wanted to go back, but life got in the way. So now I’m off to be an artist-in-residence in Rawalpindi for most of April. Last time I visited I travelled up the Khyber Pass to the border with Afghanistan. 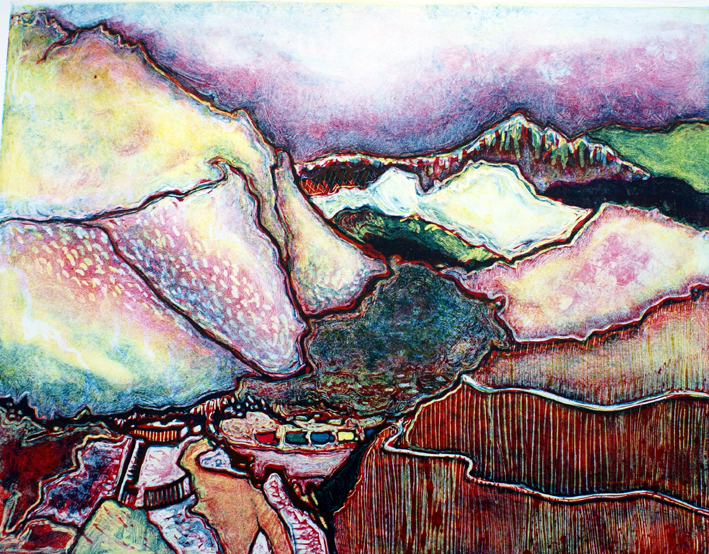 This is a large monotype I did from a tiny sketchbook drawing, standing on a hill in Pakistan with a bunch of jolly soldiers (the Khyber Rifles), looking down at Tamurlaine’s ancient fort and the Afghan border and waving at the drones going overhead. I’ve called it ‘Let Peace Prevail’ because just behind me was a sculpture erected by schoolchildren with ‘Let Peace Prevail’ written on it and it really moved me. 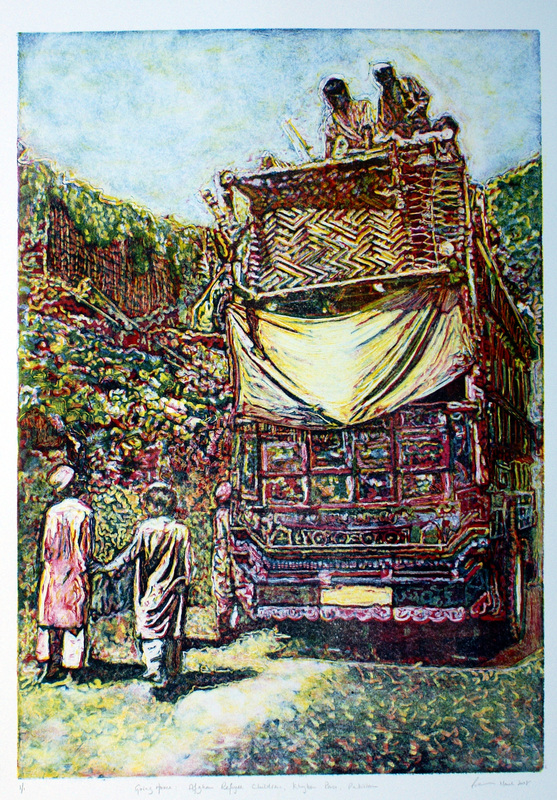 As we travelled back towards Peshawar, I took a photo of a family of Afghan refugees returning back home, looking very happy and I used it as the inspiration for this monotype. I didn’t know at the time that the situation in Afghanistan was set to become much worse. I often wonder if these children were able to resettle safely back home or if they ended up as refugees once more. My residency has been supported by Wales Arts International and Arts Council Wales.